US Secretary of State Mike Pompeo delivers speech in Cairo, vows to continue fight against ISIS and Iran. US Secretary of State Mike Pompeo vowed that the US would continue to fight against the ISIS terrorist organization despite its withdrawal from Syria. 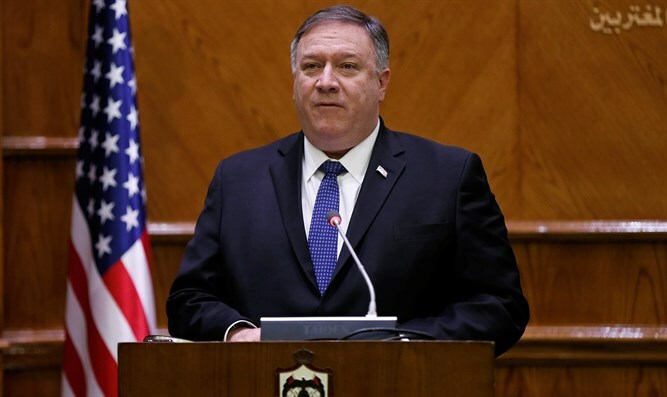 Speaking in the American University Cairo on Thursday, Pompeo said that "there's no contradiction whatsoever" in the Trump Administration's policy on Syria and its policies against ISIS and Iran. "This is a story made up by the media. That's fine, you all write what you like, but the President's been very clear, and [National Security Adviser John] Bolton and I have been very clear about this too, that the threat from radical Islamic terrorism is real," Pompeo said. "ISIS continues -- we fight them in many regions around the country. Our commitment to prevent Daesh's growth, ISIS' growth, is real. It's important. We will continue at that." "The United States' decision, President Trump's decision, to withdraw our troops has been made. We will do that," he clarified, while stating that the president would be willing to carry out further military action in Syria even after the withdrawal is carried out. "The Trump Administration didn’t stand idly by when Bashar Assad used chemical weapons against his people. President Trump unleashed the fury of the U.S. military not once, but twice, and with allied support. And he is willing to do it again, although we hope we won’t have to." Pompeo also used his speech to attack the policies of former President Barack Obama, who gave his own celebrated address in Cairo in 2009. “Remember: It was here, here in this very city, another American stood before you, He told you that radical Islamist terrorism does not stem from ideology. He told you 9/11 led my country to abandon its ideals, particularly in the Middle East. He told you that the United States and the Muslim world needed ‘a new beginning.’ The results of these misjudgments have been dire,” Pompeo said. “In falsely seeing ourselves as a force for what ails the Middle East, we were timid about asserting ourselves when the times — and our partners — demanded it," he added. He also said that the US would continue to work to ensure that all Iranian military forces leave Syrian territory and that the US would work with its allies to counter Iran's aggression in the Middle East and around the world. Pompeo's speech was titled "A Force for Good: America’s Reinvigorated Role in the Middle East."